Certainly the audio performance is up to scratch, regardless of the transmission technology. And nothing has been skimped on the build quality or comfort. So if you want to dispense with the wires, and are happy paying for the privilege, there is no better option than the B&W P5 Wireless. When Bowers & Wilkins released the T7 wireless Bluetooth speaker, its quality considering its portability was outstanding. It was also the first time the company had opted for that specific wire-free technology, having only dabbled with Apple AirPlay in the past as it sought to maintain audiophile levels of audio playback (prior Bluetooth standards lost too much detail in the transmission). However, aptX changed all of that, a Bluetooth tech capable of maintaining high quality, lossless audio performance without the need for wires. Now we're seeing the benefit of that in Bowers & Wilkins headphones, with a fully wireless version of the much-loved P5 on-ear headphones. In fact, they are actually Bluetooth-enabled versions of its P5 Series 2 on-ears that also won many plaudits at the tail-end of last year. And they share the same DNA and technology tweaks of their improved wired sibling. Are these the best wireless headphones that money can buy - if, indeed, you have enough cash to cover their £330 asking price? Aesthetically and in the materials used the P5 Wireless are nigh-on identical to the wired pair, save for a little extra depth in the earpieces to add the wireless tech required. It doesn't affect the design lines, though, and like the P5 Series 2 headphones the Wireless are tasty to look at. They also weigh just 213g, avoiding feeling like a head clamp that'll weigh your neck down. The soft leather and aluminium build helps significantly on the weight front and the P5 Wireless are extremely comfortable, especially so without a cable to tie you to anything. There's no active noise cancellation (ANC) on board, so they aren't ideal for flights or travel situations where you expect a lot of outside noise – as we discovered when nipping to Barcelona recently – but that's standard for on-ear headphones without ANC. And they work great for shorter commutes such as on a bus or the Tube. Being free from wires helps, especially when you're jammed in among other travellers who might accidentally catch the lead and yank it from your device. Also, we find that the new location for controls – on the rear of the right ear-cup – is a much more natural place that dangling a few inches from your chin. You can pause, skip and take a phone call with them and a built-in discreet microphone means you can still talk to someone over the phone hands-free (and probably look fairly crazy in doing so). The controls can also be used to fire up Siri if you have an iPhone or iPad, but they will work with Android in order to answer calls and the like (no Siri here, obviously). And considering the iPhone doesn't actually support aptX lossless audio at present, that's one Android phone owners can gloat over. That's not to say iPhone owners can't get near-CD quality sound through the P5 Wireless headphones too. They are capable of playing high bitrate AAC tracks over Bluetooth 3.0. They're not lossless and nowhere near the 16bit/44.1kHz audio streams transmitted through aptX, but they can sound a darn sight better than MP3s. But then even MP3s sound great through the P5 Wireless on-ears. The drive units inside each earpiece consist of two 40mm full range drivers, with a frequency range of 10Hz to 20kHz and an impedance of 22ohms. They are meaty where required but tuned neutrally to make all music sound as it was recorded rather than listened to in a night club. There are headphones in the higher price brackets that are so bass-heavy that while they are great for dance and hip-hop, they murder subtler notes and are therefore aren't suitable for other musical tastes. We find that the P5 Wireless headphones are superb all-rounders, with keen control over mid and high frequencies for orchestral or even rock tracks, yet with enough bass growl to boom without loosening your fillings. Identical to the excellent wired P5 headphones, in fact. We listened to a wide variety of tracks for this review, including Thunderstruck by AC/DC delivered through an iPhone 6 Plus, a lossless live version of The Who's 5:15 from its London Quadrophenia tour, and both were delivered with aplomb. We then switched to a HTC One M9 to stream several tracks over aptX and were very pleased by the results. You'll be hard pushed to find headphones as capable when playing a lossless CD rip of Public Enemy's Don't Believe the Hype at such high volume as they are Don't Look Back in Anger by Oasis. All of this is also performed alongside outstanding battery life. Bowers & Wilkins claims that the P5 Wireless headphones are capable of playing up to 17-hours of audio at around 75 per cent volume between charges - and we found much the same ourselves. In fact, 75 per cent volume is high (depending on the source) so it might even stretch to more. In addition, we left the headset dormant for an extended period and there was no issue with resuming after weeks of inactivity. The battery charge did not dissipate unlike with other Bluetooth headphones we've used in the past. And even if you do find yourself out of charge – when on your travels where there is no power point to hook the USB cable up to – you even get a conventional wired connection in the box. Remove an earcup and you can wire them up, so will never be left without being able to use them. 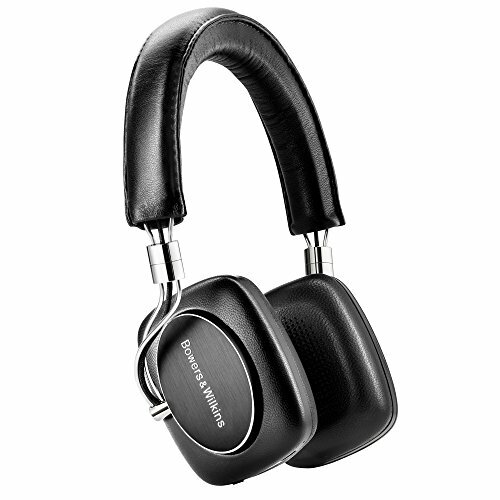 The Bowers & Wilkins P5 Wireless headphones are, quite simply, among the best wire-free cans we've heard. That's why they come at a premium. Considering the P5 Series 2 headphones on which they are based are £80 cheaper, at £250 rather than £330, you will have to ask yourself whether cutting the cord is worth it. But we feel that the cable does get in the way with on-ears, and we love the freedom the Wireless model affords.